Once a local Certificate Authority (CA) has been created, you can generate certificates. The first certificate created is usually for the Smoothwall that the Certificate Authority is installed on. This is because the Smoothwall VPN gateway is a separate entity to the Certificate Authority, and therefore requires its own certificate. It is normal for a single Certificate Authority to create certificates for all other hosts that is used as VPN gateways, that is, all other Smoothwalls. 1. Go to the Network > VPN > Certificates page. Not recommended but available for interoperability with other VPN gateways. Recommended for most site-to-site VPN connections. This does not need to be a registered DNS name. Recommended for site-to-site VPNs whose gateways use static IP addresses. Recommended for roadwarrior or internal VPN connections. This does not need to be a real email address, although the use of a real email address is recommended. • ID value — Enter an ID value. For a site-to-site Smoothwall VPN this is typically a hostname. For a roadwarrior this is usually the user’s email address. • Common name — Enter a common name for the certificate, for example, Head Office. • Life time — From the drop-down menu, select the length of time that the certificate is valid for. • User defined (days) — If User defined is selected as the Life time value of the certificate Authority, enter the number of days the Certificate Authority is valid. 3. Click Create signed certificate. The certificate is listed in the Installed signed certificates panel. You can review the content of a certificate. Reviewing certificates can be useful for checking certificate content and validity. 2. Locate the certificate that you wish to view in the Installed signed certificates panel. 3. Click the certificate name. The content appears in a new browser window. 4. Close the browser window to return to the Smoothwall. Any certificates you create for the purpose of identifying other network hosts must be exported so that they can be distributed to their owner. 1. Go to the Network > VPN > Certificates page and scroll to the Installed signed certificates area. 2. Select the certificate you want to export. • Certificate in PEM — An ASCII (textual) certificate format commonly used by Microsoft operating systems. Recommended for all Smoothwall to Smoothwall VPN connections. • Certificate in DER — A binary certificate format for use with non-Smoothwall VPN gateways. • Private key in DER —Exports just the private key in binary for use with non-Smoothwall VPN gateways. 4. Click Export. Choose to save the certificate file (a .pem or .der file) to disk in the dialog box launched by your browser software. The certificate is saved to the browser’s local file system in the specified format. Note: Distribute the certificate to its recipient host in a secure manner as it contains the private key that should only be known by the certificate owner. PKCS#12 is a container format used to transport a certificate and its private key. It is recommended for use in all Smoothwall to Smoothwall VPNs and L2TP roadwarriors. 2. 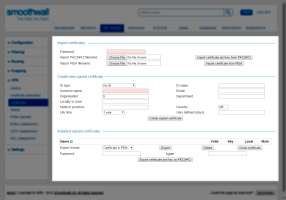 In the Installed signed certificates region, locate and select the certificate that you wish to export. 3. Enter and confirm a password in the Password and Again fields. 4. Click Export certificate and key as PKCS#12. 5. Choose to save the PKCS#12 container file (a .p12 file) to disk in the dialog box launched by your browser software. The PKCS#12 file is saved to the browser's local file system. 2. In the Installed signed certificates region, locate and select the certificate that you wish to delete. 3. Click Delete. The signed certificate is removed from the Installed signed certificates region. The Smoothwalls that do not have their own Certificate Authority are required to import and install a host certificate to identify themselves. This is the normal process for secondary Smoothwalls, for example, branch office systems connecting to a head office that has a Smoothwall and Certificate Authority. 1. Go to Network > VPN > Certificates. 2. In the Import certificates panel, enter the Password that was specified when the certificate was created. • Click Choose File from Import PKCS#12 filename. • Locate the relevant certificate, and click Open. • Click Import certificate and key from PKCS#12. • Click Choose File from Import PEM filename. • Click Import certificate from PEM.